Burdock. Arctium minus (Hill) Bernh. Cockle button, cuckold dock, beggar's-buttons, hurr-burr, stick-button, hardock, bardane. Burdock, one of our most common weeds, was introduced from the Old World. It grows along roadsides and in fields, pastures, and waste places, being very abundant in the Eastern and Central States and in some scattered localities in the West. Burdock is a coarse, unsightly weed. During the first year it produces only a rosette of large leaves from a long tapering root. In the second year the plant grows to a large size, measuring from 3 to 7 feet in height. 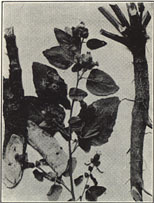 The stem is round, fleshy, and much branched and bears very large leaves, the lower ones frequently measuring 18 inches in length. The flowers are not produced until the second year, appearing from July until frost. They are purple and are borne in small clustered heads armed with hooked spines, and the spiny burs thus formed are a great pest, attaching themselves to clothing and to the wool and hair of animals. The plant has a large fleshy taproot. When dry this root is much wrinkled lengthwise. The roots, collected from plants of the first year's Growth. As they are large and fleshy they are likely to become moldy, and it is best to slice them lengthwise, so that drying may proceed more rapidly. The roots of other species of Arctium are also used. prev: Bugleweed. Lycopus virginicus L.
next: Butterfly Weed. Asclepias tuberosa L.